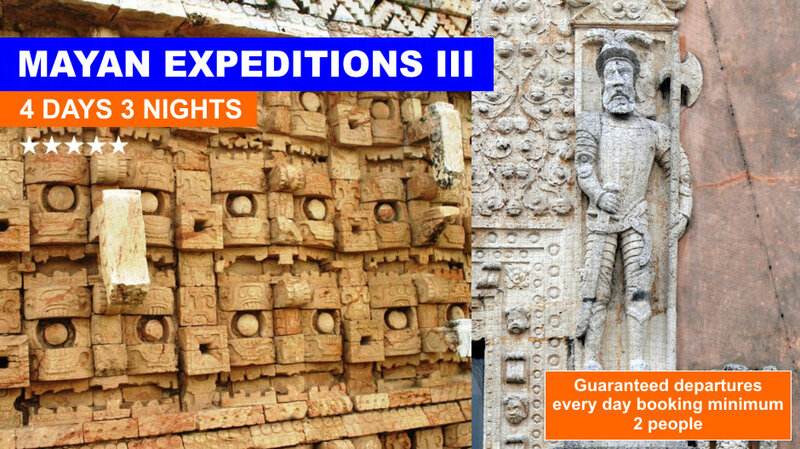 One of the most complete tours on MÃ©xico, where you can experience the Mysteries of the Mayan Culture, the historical cities of the Peninsula and the natural experience unique from this region. A journey like no other!! A/C Car, Van or Bus TRANSPORTATION. FOUR NIGHTS ACCOMMODATION based on double occupancy (two people). 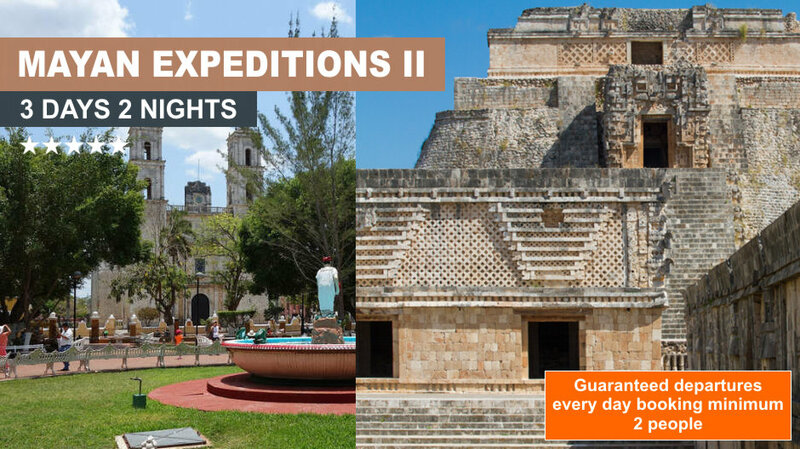 Depart from Cancun to Merida; on the way we will visit VALLADOLID as partIncensory holder known as Ox Puluu Ku, They were replaced every 20 years and buried in the temples of our day; this is the second largest city in the state of Yucatan founded in 1543. 22 kms. to the north an interesting visit to EK BALAM will be done; this is one of the lastest mayan cities to be discovered; its name means the -Jaguar Star- the city displays monumental architecture, walls, steles and so-called hieroglyphic serpents and statues skillfully carved from blocks of stone. Continue to MERIDA. Overnight. Tour to CELESTUN to admire the pink flamingos such as one of the largest varieties of birds around the world; a small boat will be used in this experience, time to swim will be provided. Return to Merida. Overnight. 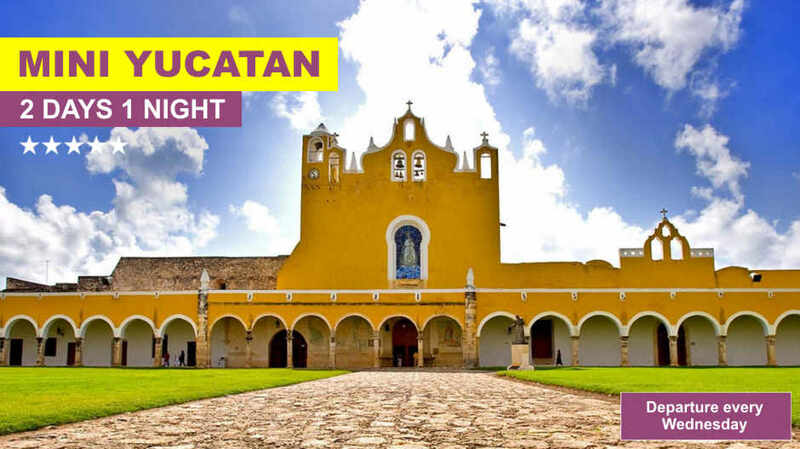 Depart to Uxmal, on the way the route of churches will be visited; MANI, the place where Mayan idols and books were destroyed in times of the conquest. TICUL city of clay and leather workers. Light & Sound Show at UXMAL (optional). Overnight. Visit of UXMAL and KABAH early in the morning.Priestess that seems to workship the images of snake These two sities together were part of the "Puuc Region" characterized by the prominence of "Chaac", the rain god, who is venerated, cunjured and evoked through the magical repetition of this image. We will head towers IZAMAL to visit this quaint colonial city where time seems stopped. The city´s convent has the second largest atrium around the world after the one at St. Peters in the Vatican. 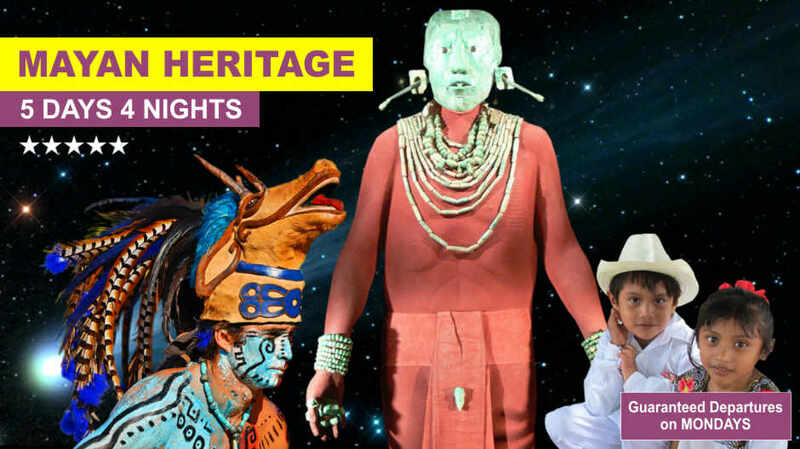 Ride to CHICHEN ITZA to enjoy the Light and Sound Show (optional). Overnight. 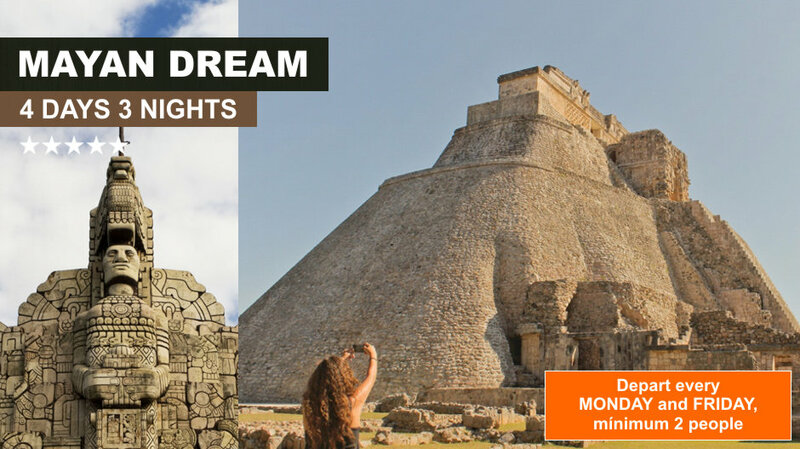 CHICHEN ITZA: The "Mouth of the well of the Itzaes" with its impressive constructions; the splendid Castle or Pyramid of Kukucan with is a great example of the advanced civilization that lived there, the ball coaurt, the observatory and the sacred well will be breathtaking. Then ride back to Cancun and final drop off. Guaranteed departures every day booking minimum 2 people. Hotels for this tour are three-star. Take cash, many are not accepted Bank Cards locations. Take the necessary, during our tour we will have several stops. Do not forget your camera and charger (110V power).